Magnetic signs are printed on a 30 mil magnetic material. The magnets include lamination. They are digitally printed in full color. The magnets work well on cars and vehicles. The standard finishing option for magnetic signs is square cut. You can also have rounded corners or or contour cut. All magnetic signs include a laminate finish. The standard production time is 7-10 business days. 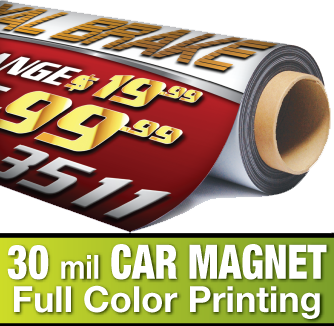 The max print width for magnetic signs is 24" x 72". Three of our most common sign sizes are listed. - Rounded Corners - add $1.00 each cut. - Contour Cut - add $2.00 per square foot. 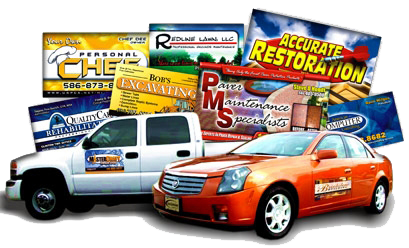 - All magnetic signs include a laminate finish. There are lots of ways you can use magnetic signs. Here are some of the most common types of magnetic sign uses.